Folding survival blades are a popular submarket in the knife industry today, and Gerber was not content to sit on the sidelines. 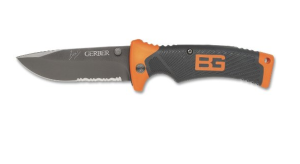 The collaboration between knife manufacturer Gerber and survival specialist Bear Grylls continues to bring some interesting and effective tools to market. 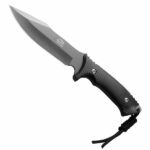 One such item is the Gerber Bear Grylls Folding Sheath Knife, a lightweight and ruggedly built folding knife designed to be easily carried on a hike or camping trip and just as easily deployed for a myriad of duties. The Folding Sheath Knife is aimed at people who want a tough blade, but who favor something smaller and more portable as opposed to a larger fixed blade. This folding knife sports an open length of 8.5″, right on par with many of the large folding knives on the market. The Folding Sheath Knife really hits the mark when it comes to portability, however. When folded, this handy blade shrinks to a compact 4.9″ making it easy to slip into a pocket on your pants or your backpack. Adding to its ease of carry, the knife weights in at an impressive 4.3oz., making this the type of knife you can wear all day and forget you had it on you. One of the reasons the Folding Sheath Knife is so light is because of its construction. Because there is no continuous piece of steel going through the blade, it cuts out a lot of the weight you would find in a comparable fixed blade knife. Gerber also saw fit to omit steel liners, a common construction method among folding knives to add structural rigidity. The handle is made of an extremely durable injection molded plastic and, even without the steel liners, manages to inspire confidence in its strength. Ergonomics for this folder are outstanding! The handle is coated with a grippy rubbery material that, along with the striped pattern in the handle, jimping, and a deep finger choile, offer the user a secure grip no matter how slippery the conditions get. Within the handle is a lockback mechanism supporting the folding blade. This design is generally stronger than a linerlock mechanism, making this Gerber Bear Grylls product one of the better choices for a survival folder. The 3.6″ long hollow ground blade is an extremely useful drop point style blade shape, one of the better designs for all around use. While Gerber does not list the specific steel used, they do mention that is a high carbon stainless steel. This makes the blade less prone to rusting in moist conditions the way a purely carbon steel would. 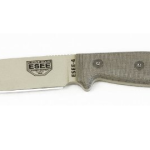 Gerber offers the Folding Sheath Knife with a plain edge or partially serrated edge depending on personal preference. 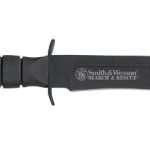 Deploying the Folding Sheath Knife is as easy as it is to carry. Because it’s designed to be carried in its sheath, Gerber has not fitted this blade with a pocket clip so there is no need to worry about tip up or tip down, or swapping a pocket clip for left hand or right hand carry. It also sports a completely ambidextrous thumb stud, making it easy to put the stainless steel blade into action with one hand. 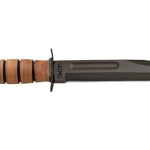 Made of a military grade mildew resistant nylon material, the sheath feels tough and capable of giving many years of flawless service in carrying your knife. It also features belt loops on the back for horizontal or vertical carry on the belt or to be strapped to your backpack or other gear. The sheath also packs the obligatory Bear Grylls Priorities of Survival pocket guide, a fold out pamphlet full of helpful tips and tricks to help you survive if you ever find yourself in a bad situation or just need to reference something while you are out in the wild. 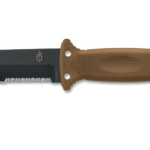 The Gerber Bear Grylls Folding Sheath Knife strikes a great balance between being tough enough for survival while still being light enough to make someone want to carry it often. With a price around $20, it also strikes the right balance between quality and value. The Folding Sheath Knife is perfect for those that want a handy folder on their outdoor excursions that will not slow them down or break the bank.